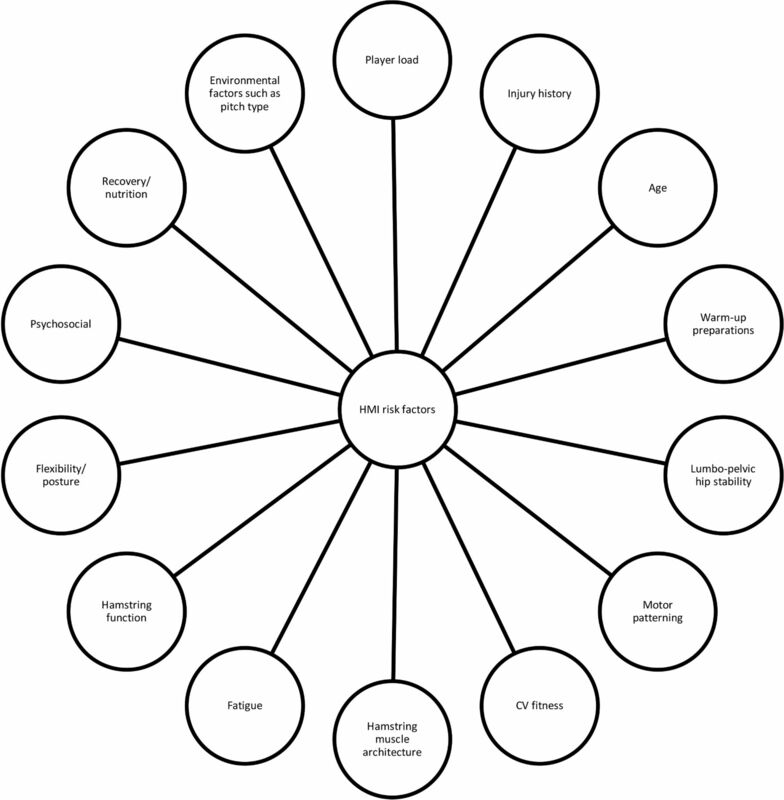 Within elite football, there is a large disconnect between evidence-based practice and the actual interventions used by science and medical teams to prevent injuries.12 In line with an emerging body of evidence-based research, we believe that preventing HSIs in elite football requires a holistic approach, which considers multiple risk factors and their inter-relations, implemented effectively.6–8 13 In designing our injury prevention programme, we combine both the theory and the available evidence on HSI risk factors and intervention studies, as well as considering the context surrounding the player when designing our overall injury prevention approach. To prevent HSIs, it is important to understand why they occur, so that an appropriate intervention can be developed, targeted at the specific risk factors. Importantly, there is not a clear understanding of why HSIs happen. Although there is a wealth of research examining HSI risk factors, there is a lack of evidence reporting consistent prospective risk factors for HSIs,14–16 and also a lack of research examining how the supposed risk factors interact with one another.7 17 Despite the difficulties of studying the interactions of multiple risk factors, it appears that risk factors do not operate in isolation, but instead function as a complex web of determinants.17 As such, our first approach when designing an HSI prevention programme is to consider all the possible risk factors which may be implicated, blending theory, evidence and anecdotal experiences (see figure 1). A diagram of factors to consider in hamstring muscle injury prevention. CV, cardiovascular. Table 1 depicts the approach of our practitioners when considering the contents of the programme. It contains the list of risk factors linked in some way to HSIs, either through prospective or retrospective research studies, or from anecdotal evidence from within our group. Clearly, when designing a programme, one cannot specifically target every possible risk factor or assign equal weight to all risk factors. Instead, it is essential to rank the factors in order of importance considering both specific and general risk. This is by no means an exhaustive list, nor do we suggest that any of the risk factors displayed are permanently associated with the table category (eg, acute:chronic workload ratio (ACWR) could in some cases be moved to any of the other categories depending on the overall factors presented by the player). In our experience, those risk factors presented in the ‘Recognised but does not inform normal practice’ category are explored in more complex/detailed cases of preventing HSI. Multidisciplinary team-mediated player discussion in preseason serves to inform an individual’s programme design and resource allocation. Successful preparation and acting on player-related recommendations in professional football are highly dependent on ‘buy in’ from key decision makers (coaches, players and chief executive officers).18 Coaches exert influence on injury risk,19 and as such, any injury prevention strategy needs to have their support. The Sports Medicine and Science department should seek to understand the expectations that coaches and management staff have of them; and medical and performance strands should explore how the coaching team prefer to receive information (eg, chunking information, succinct messages, diagrammatic methods). Furthermore, the support staff implementing an injury prevention strategy should be mindful of how important education and communication is.20 The fundamental principles which may be obvious to the practitioner should be put into the context of each of the audiences they are dealing with to aid in an understanding of the process. With open and honest discussion and two-way communication, there will be an opportunity to feed into the injury prevention process and ensure it is the best fit for the individual. We believe an essential element of HSI prevention programmes is the individualisation of the programme, targeted at the individual’s injury risk profile. Players are typically screened by the Sports Medicine and Science department for health evaluations, musculoskeletal evaluations, athleticism (eg, strength, speed, power and agility), psychological profile, injury history, neuromuscular control/movement quality and hamstring strength, typically at the start of each season. This information, in conjunction with appropriate ongoing injury reporting, screening and monitoring processes, provides the necessary information to create individualised training approaches to reduce player injury risk by targeting specific risk factors relevant to the players’ profile,21 while also serving as benchmark criteria for return to play. It is important that any HSI prevention programme be implemented as part of a complete injury prevention and performance programme. HSIs account for 12% of the total injuries sustained,22 and as such are the most common injury in elite football. However, they should also put in context alongside other injuries (which constitute the remaining 88%). Thus, recognising the interplay between general risk factors for all injuries and maximising the crossover of interventions is important in programme design. Below, we present our five-point HSI strategy, which contains research evidence as well as clinical experience in a truly evidence-based approach, generalisable to all elite-level teams. Additionally, this can be scaled appropriately to inform HSI prevention at all levels. Poor intermuscular and intramuscular coordination can result in insufficient expression of isolated strength functionally. Suboptimal strength/activation of the stabiliser muscles can result in compensatory recruitment of the agonists and antagonists for dynamic joint stability (eg, to act as global stabilisers). This would result in compromised force output.39 40 There must also be an acknowledgement of the continuum of complexity in regard to the coordination and activation patterns involved in actions like sprinting/ball striking versus the isolated strengthening that takes place in the gym. While both have their place, the progressions and constraints placed on the athlete are key to minimising the occurrence of HSI. In terms of our approach to hamstring muscle strengthening, we, like many teams in elite football, value the role of eccentric strength training,41 but do not adopt the full NHE programme.11 Instead, we use a more holistic approach to hamstring muscle strengthening,13 one which recognises the need for optimal hamstring function (maximal and explosive strength across the force-velocity profile, balancing the focus on isometrics42 and eccentric and concentric actions). Although isometrics are perhaps less understood/researched than eccentrics, practice-based evidence has seen a big shift towards this in recent years. Additionally, it is important to recognise the need for both knee flexor and hip extensor strength; the similar morphological adaptations (hamstring eccentric strength and fascicle length changes) which accompany both knee dominant and hip dominant hamstring strengthening exercises27; similar adaptations to both low/high-volume NHE43; and the need for specificity in training.39 We focus primarily on the use of running (HSR, high speed acceleration and attaining peak running speed), given its high specificity (and possible performance benefits), the large hip and knee joint torques36 and biomechanical symmetries to HSI mechanism and reduced barriers to its implementation. Admittedly, there is limited research into hamstring adaptations to sprint running (vs commonly assessed NHE), but recent research indicates that regularly achieving peak or near-peak running speeds in training is associated with a lower risk of HSI.44 As such, we aim to expose all players to within 95% of maximum speed one to two times per week. This programme is supported by gym-based individualised strengthening programmes (balancing the combination of hip and knee dominant and isolated and compound exercises) depending on player and coach buy-in and current playing status (eg, additional gym-based hamstring eccentrics are not sensible during congested match play in regular starting players). Also, injury history and the player profile support the programme design. We specifically look for players who have poor eccentric hamstring strength (<350 N)30 or a right to left asymmetry in eccentric strength (typically >10% although we state this with caution as there are individuals who naturally appear to have a greater deficit than this up to 25%45 46), assessed using the NordBord. We currently use fatigue resistance (single leg bridge to capacity test47) primarily for return to play monitoring. Perhaps the most important element of preventing injuries in elite football lies in optimally managing player load. 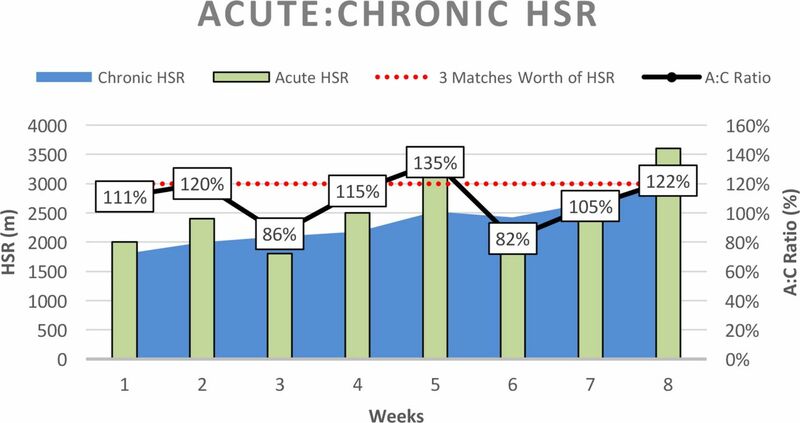 There is emerging evidence that heightened ACWR which accompanies congested match play is one of the key factors leading to increased injury risk.48–51 Exposing players to large and rapid increases in HSR distances above their two yearly session average was shown to increase the odds of HSI. In particular, elevated HSR in the week before injury demonstrated a 6.4 times increased risk of HSI.52 Previous research by our group indicated higher accumulated and acute workloads were associated with a greater injury risk, but progressive increases in chronic workload may develop the players’ physical tolerance to higher acute loads and resilience to injury risk.49 Other researchers have also found high training loads to be protective in elite team sport.51 In terms of ACWR, it appears that HSR may be more predictive of HSI risk52 and exposing players to large and rapid increases in training above what they are habitually used to increases the odds of sustaining an HSI. A high ACWR may be in part due to a low chronic training (eg, low denominator) or congested match play (eg, typical of the winter periods or when involved in European or domestic cup match play). In terms of our approach to managing players’ training workloads, we monitor the ACWR using Global Positioning System technology (and TRACAB for match loads), limiting exposure to high ACWR (<1.4, although this appears to be largely individual), particularly in HSR (>5.5 m/s) and very HSR (vHSR; >7 m/s). This should be achieved by progressively increasing player training load (avoiding spikes in acute loading) to achieve long-term moderate to high chronic training loads, which aim to prepare the players for the equivalent of three matches worth of load per week (figure 2). Thus, during fixture congested periods, the players have a greater tolerance and robustness for the heightened loads. Additionally, while the load increases are progressive, they involve week-to-week fluctuations, involving deloading periods for adequate rest and recovery, as well as periods of overloading to produce adaptation53 (figure 2). Within this, we acknowledge that consistently high loads may lead to other stress-related injuries and that an individual’s physiological response to spikes in ACWR may vary; thus, experience in managing individual responses should still be considered, as should individual banding of speed thresholds to better reflect energy system output. Graphical representation of the progressive increase of a player’s chronic high-speed running over the course of an 8-week intervention. The player begins with a chronic load of 2000 m representing a two-match load and is trained with the goal of progressively increasing his chronic training load, adopting a structured periodisation model to fluctuate the weekly training demands to achieve a chronic high-speed running of three matches equivalent per week. The current programme used a 2-week overload and 1-week deload maintaining the acute:chronic workload ratio below 1.4 (peak 1.35) and deload week remaining above 0.8 (lowest 0.82) to prevent acute heightened risk of injury. A, acute; C, chronic; HSR, high-speed running. An additional important element of managing player load is to recognise this is not just physical, but can also be psychological/emotional. Psychosocial factors (ie, stressful life events) may contribute to injury risk.57 Elite football can be highly stressful, and as such recognising psychological load may also be important. Therefore, load monitoring strategies need to encompass all forms of load (eg, wellness questionnaires, sleep, ratings of perceived exertions, training and match loads). Additional in-depth analysis (eg, assessment of hamstring isometric strength after match play)58 should be undertaken with high-risk players (eg, older and/or previously injured players14–16), which can support an optimal load management strategy and possible early warning system. A widely held belief in elite sport is that that lumbopelvic hip stability training is important in the prevention of HSI. However, its use has recently been questioned due to a very small amount of evidence to support this.59 However, based on the available theory, positive anecdotal experience and a link with other injuries,60 we promote its inclusion as part of a holistic approach to preventing HSIs. For instance, the pelvis is responsible for load transfer between the lower limbs and the spine.61 Aberrant pelvic motion, specifically anterior pelvic tilt, or trunk motion such as lateral trunk tilt during sprint running is thought to increase HSI risk.62–64 Leg-length asymmetries are associated with innominate bone rotation64 and an asymmetry greater than 1.8 cm is linked with a fourfold heightened risk of HSI.65 An uncontrolled anterior pelvic tilt during sprint running can elicit substantial stretch on the hamstring muscles, thereby increasing tension on the BFlh in terminal swing phase.66 Hip flexor tightness is a prospective risk factor for HSIs15 67 and is associated with an anterior pelvic tilt in sprint running, increased stretch on the hamstring muscle at late-swing phase and also associated with inhibition of the gluteus maximus, via reciprocal muscle inhibition and subsequent synergistic dominance of the hamstring muscles.68 69 Hip extension torques can exceed double that of knee flexion torques during sprinting,36 and so reduced strength or activation of the gluteus maximus (both identified as prospective risk factors for HSI)37 70 would elevate the demands placed on the hamstring muscles. It appears that altered lumbopelvic stability, alignment and coordination can both limit the expression of hamstring strength at longer muscle lengths (eg, terminal swing phase) and simultaneously elevate their demands. Comerford and Mottram71 offer a framework for the assessment and retraining of uncontrolled movement, when applied to the lumbopelvic hip complex. This offers a logical system-based approach which can assist the practitioner in establishing the site and direction of uncontrolled movement in both low/high-load situations. Practitioners should consider the training dichotomy between (1) the efficiency of local stabilising muscles, tonic in nature with slow motor units, which are used for non-fatiguing functional tasks, controlling translation and contributing to postural control, versus (2) high threshold, global stabilising muscles, whose predominant fast motor units are phasic in nature and capable of generating high force to limit or decelerate range of motion.68 Many methods exist for training stability within the lumbopelvic hip complex. Floor-based exercises, Pilates adjuncts or machines may be convenient methods to isolate movements, challenge postural awareness and ability to dissociate, and build muscle capacity; and all have a component part in our practice of HSI prevention. A key element of these isolated exercises is to ensure optimal recruitment of the target muscles, recognising the possibility of primary agonist inhibition and subsequent synergistic dominance.69 Yet the law of specificity should be respected to ensure transference to athletic tasks (see point 5). There is evidence indicating an important role of player’s physical conditioning (eg, general lower body compound strength and cardiovascular (CV) fitness) in reducing risk of injury. Across a range of sports, those with superior physical qualities are more robust to injury.72–74 Additionally, the implementation of strength training has been shown to reduce injury risk.75 Elevated ACWR is associated with injury,48–51 but those athletes who are stronger73 and have superior CV fitness74 are better able to tolerate elevated ACWR. Our programme consists of a general strength and conditioning approach for both performance optimisation and injury risk reduction. Often training and match play provide a sufficient stimulus for CV adaptation/maintenance. However, it is important to monitor players’ HR responses to training and where necessary provide additional off-feet conditioning (eg, we incorporate hypoxic interval-based high-intensity session on the bike/cross-trainer, achieving set targets of HR). Off-feet conditioning is also important for the load compromised player (eg, less robust players with high risk of injury or extensive injury history or the player returning from injury, and as such typically having a lower chronic training load) in reducing injury risk. We also use this approach with target red zone (>85% max HR) minutes, training impulse, or sessions that match the output of the training group/high-intensity periods of the game to replicate the energy system demands. We have a philosophy of assessing/improving the fundamental movement patterns (squat, step lunge, hinge, jump, land). Such movements need to be performed in different directions, speeds and planes to improve athletic movement and reduce the risk of potential injury.81 Practising athletic movement challenges coordination, timing and neuromuscular control, and is associated with an increased ability to express and apply strength functionally (eg, in sporting-type movements such as running).39 40 82 Programmes incorporating athletic movement with good technique and repetition may enhance neuromuscular control and sequencing. Specific drills which break down components of the running action, focusing on a stable pelvic position, and upper and lower limb position during marching, skipping and running tasks form an important component of our conditioning continuum. These qualities are trained in a variety of ways as part of on-field warm-ups, physical development sessions in the gym and preactivation sessions prior to regular football/skill-based training. A graded approach which establishes good technique at slower speeds and simple tasks establishes a basic competence which supports the development of drill speed and complexity, further challenging neuromuscular development of strength, control and sequencing within athletic tasks, which we feel supports both performance enhancement and injury reduction. Anecdotally, these drills naturally assist the development of linear speed and acceleration programmes and seem of value improving pelvic and hip position, as well as upper and lower limb position, particularly at speed. It should be noted however that they are biased towards sagittal plane horizontal movement, and that field-based sports which are inherently multidirectional in nature require support in this approach with movement quality drills which develop jumping, landing, deceleration and change of direction. This paper presents our five-point strategy for preventing HSIs. We believe that high HSI rates are in part due to the recommendation of a simple single component approach to a complex multifactorial problem. We suggest from our learning experiences that there is a need for a holistic approach that translates existing knowledge on HSI injury risk and applies this to a football context. However, it is important to recognise the contextual factors which can influence the adoption, implementation and sustained use of such a programme. We advise those in football when designing their HSI prevention strategy to gain key stakeholder buy-in, consider HSIs as part of an overall prevention strategy and treat the individual player where possible. We do not seek to discredit the use of any one particular programme in HSI prevention; we suggest rather than implement a single modal intervention, we encourage a holistic approach and consider the complex interaction of multiple risk factors in HSI alongside our five-point strategy. This approach is not wholly evidence based, but we believe this represents a judicious approach to HSI prevention, which builds on our shared anecdotal experience and remains evidence informed. Our goal is to share our approach as we believe it can form part of the journey towards the current best practice approach to HSI prevention at both elite and other levels of football.
. Neural adaptations explain the task specificity of strength changes after resistance training. Scand J Med Sci Sports 2015;25:640–9.
. The effect of high or low volume Nordic hamstring exercise training on eccentric strength and biceps femoris long head architectural adaptations. Scand J Med Sci Sports 2018;28:1775–83.
. Does deep-water running aid recovery from stretch-shortening cycle exercise? Communication to the Sixth Annual Conference of the European College of Sport Science, Ko¨ ln, Germany, July. 2001Stone MH, Moir G, Glaister M, Sanders R. How much strength is necessary? Phys Ther Sport;2002:88–96.
. Saunders WB , ed. Integrated, multimodal approach to the treatment of pelvic girdle pain and dysfunctionMagee ed. III: Treatment of Pathology and Injuries, 2000:473–84.
. Effect of restricted hip flexor muscle length on hip extensor muscle activity and lower extremity biomechanics in college-aged female soccer players. Int J Sports Phys Ther 2015;10:946–54.
. Diagnosis and Treatment of Movement Impairment Syndromes. Oxford, UK: Elsevier Health Sciences, 2013.
. Effects of muscle strengthening on vertical jump height: a simulation study. Med Sci Sports Exerc 1994;26:1012–20. Contributors MB proposed the topic of the paper and wrote the first version as a follow-up to a previous editorial from the group. All other authors provided intellectual contributions as part of the redrawing process in each of their respective areas of expertise.